H finally had his Star Wars birthday party. We had to wait over a week from his actually birthday until we could hold his party. That was apparently long enough for him to think that he was have his next birthday already. It took us all day to convince him that he was actually still 5 and not 6 and wouldn’t be 6 until next May. He was very disappointed once he figured out we weren’t kidding. 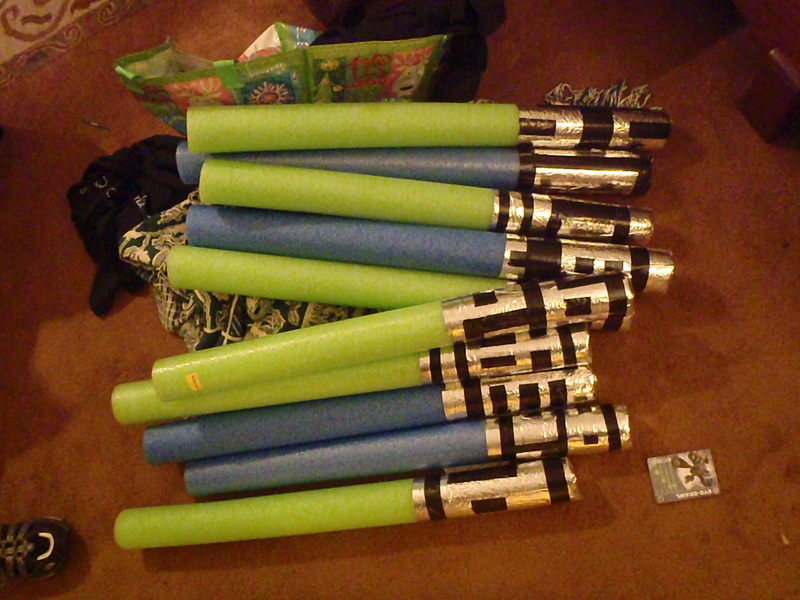 We decided to have a Jedi Training Academy. We even got t-shirts. 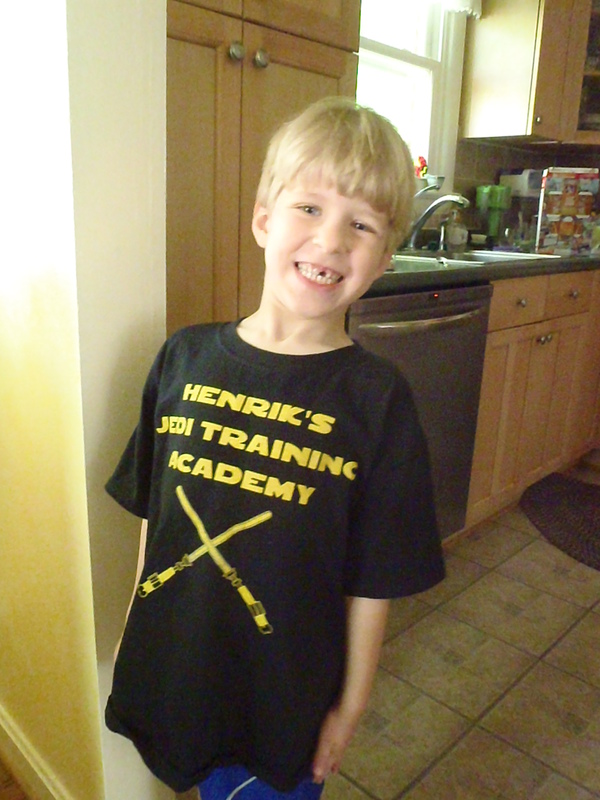 H’s Jedi Training Academy! T-shirt courtesy of CustomInk. The cake was made courtesy of our friend Gary. In a past life he was classically trained as a chef and he auctions off his cake making abilities at our school’s silent auction every spring. 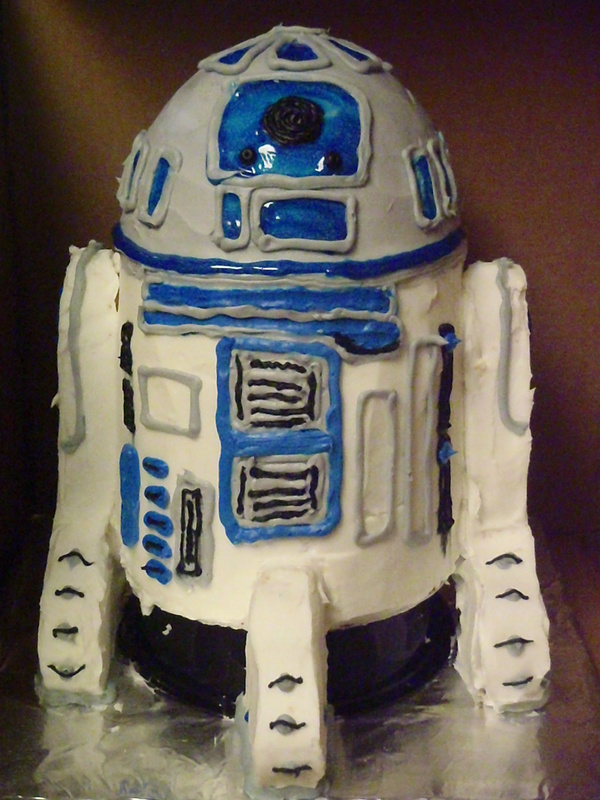 This year I snagged it and he obliged in making H an R2-D2 cake. It is amazing how much it looks like Artoo. 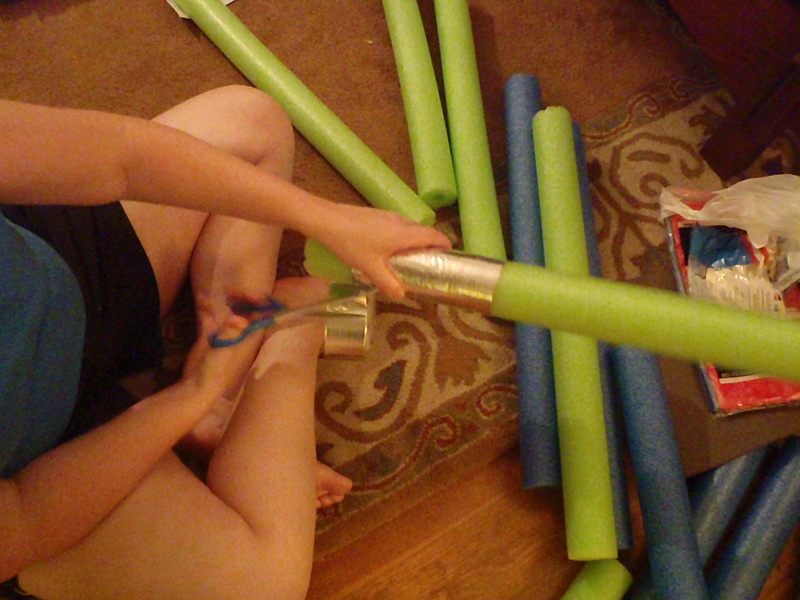 Then we needed lightsabers for our little Jedi Academy recruits! 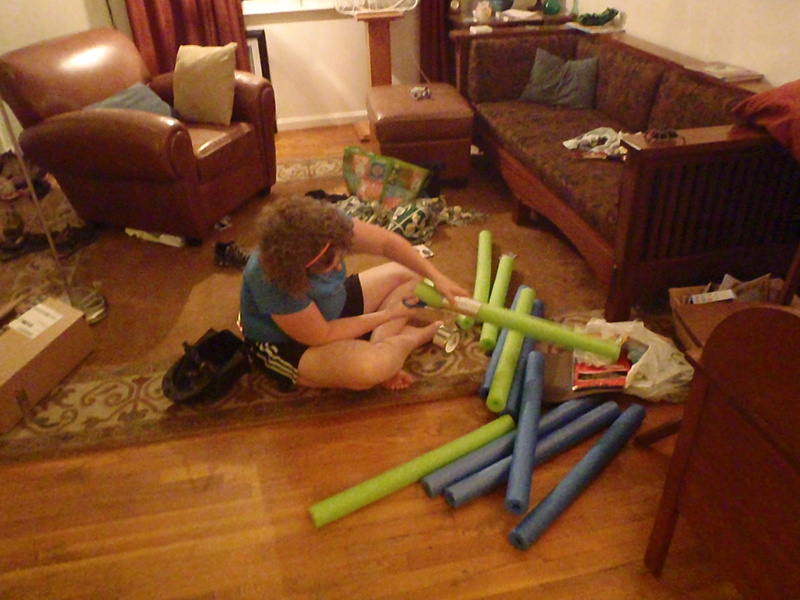 I bought pool noodles at 5 Below for $1 each. I cut them in half and wrapped the cut end with shiny silver and black duct tape from Michael’s. And Voila! A neat party favor for about 60 cents each. Shiny Tape from Michael’s makes the perfect lightsaber handle. We also had some really cute and punny names for the food. Obi Wan Kebabies (fruit kebabs). “Han”burgers. “Hutt”dogs. Wookie Cookies (some chocolate chip cookies). Yodamole and Jango Mango Salsa with Chief Chirpa Chips. Wicket sticks (veggies sticks) with Droid dip (ranch dip). And to drink we served Vader-ade (pink lemonade). It was all very, very cute. We also had a great obstacle course laid out in the back yard. Unfortunately those pictures didn’t turn out so I’m just going to list them. First they had to do Yoda’s Brain Teaser, which was a match game. I took architecture board and spray glued pairs of Star Wars pictures onto them. Then we laid them out face down and they had to make matches before they got their lightsaber. Then they went onto the next station. Which was to go through a hyperspace worm hole! That was one of those nylon tunnels draped with black fabric. It was hilarious to see them wiggle through. Then they had to walk carefully across a phase beam (balance beam laid over a dark blue plastic table cloth) to get to the red wall they needed to knock down with The Force. The wall was made out of tin cans that we spray-painted red and the force was a softball. They kids really loved this one. And at the end they had to battle their way through a field of Stormtroopers! I took white balloon, blew them up, and then used a pumpkin carving stencil and traced stormtrooper faces with a black Sharpie on all of them. I only did 10 and it didn’t take a long time. Plus they looked really, really cool. We tied ribbon to the ends and then hung them up in a tree and they kids batted the heck out of them with their lightsabers. They really went after them! And when they were done they could go back and do any of them all over again. They were at this for an hour. 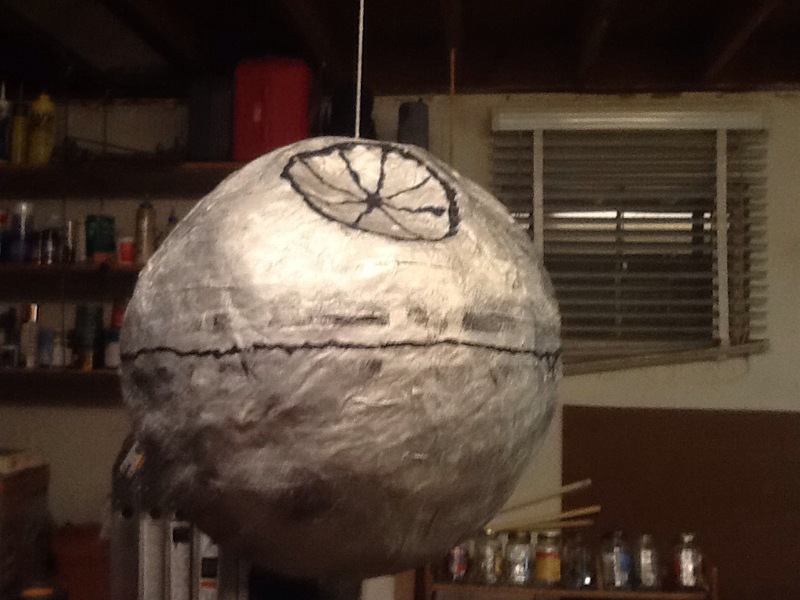 After we had some food and some time to play we hung up the Death Star Pinata. The total finale. The parents were totally impressed and the kids were chanting “Henrik Rocks!” over and over. It was so freaking cool.